May 25th marked the third year my dear friend, Jaymi, and I celebrated World Tarot Day. As it also coincides with Towel Day, we decided we’d create our own holiday mash-up. The first year I believe we actually did our readings on towels laid out on the floor, while sipping tea. 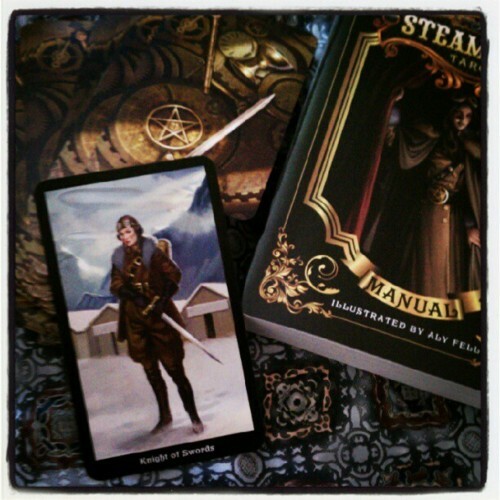 To commemorate this occasion, I brought my newly acquired (and heavily lusted) Steampunk Tarot deck to work with me. I wanted it to get out in the world. Since owning the deck, I’ve only done one two-card reading and it was basically me asking the cards (aka “Steamy”) what kind of relationship we would have. Quite promising, it displayed my Life Card and Judgment — a good connection where the messages will be strong and clear. Nothing. Not a damn thing. You are a beautiful, amazing deck, and we will work together for the good of all. C’mere and let me give you a hug. I’m not joking. After such a harsh critique from someone who doesn’t know tarot and with me still working on that “New Deck Bond”, during my lunch break I took my deck outside, sat in the sun, and spent some positive quality time with it. I even did another two card reading and the results were strong and clear. Over at Jaymi’s house later in the afternoon, we shared tarot spreads and did a quickie reading on ourselves with our respective decks. I pulled one card — Knight of Swords. “Look at my plan; have you ever laid eyes on anything so lovely?” is the snippet from the book by Barbara Moore. It goes on to say: Someone whose actions are motivated by new ideas, systems, and communication. Well, I heard something else from the Knight. The pen is mightier than the sword. Write more. Blog more. Movement….effort….chug chug chug. Jaymi and I discussed strategy on how I can be better, more consistant with my blogging because, gosh darn it, I do have things I want to say and share. Problem being, when I get home from work I’d rather veg than continue to be productive. That very evening, during a rather awesome Pacific Northwest thunderstorm, we drove to a friend’s Tarot Party. It was an intimate gathering of other tarot enthusiasts as we drank wine, nibbled on hors d’oeuvres, and danced to disco music in the kitchen. We gathered to share decks and talk shop. At one point, one of the ladies wanted to see my Steampunk deck. While she was looking through it, the still new gloss of the cards made them very slick to hold and soon went spilling across the floor. All were accounted for, but what made Jaymi and I laugh was all the cards were face down except for one — the Knight of Swords.